The best of Chinese and European cuisine. Fine dining in unsurpassed historic atmosphere. Full a la carte lunch and dinner menu specialising in local produce and local wines. Set on a tree-lined avenue, Mount Aspiring Hotel offers a peaceful, comfortable base from which to enjoy the delights of the area. Dunedin restaurant centrally located offering fine cuisine in quiet intimate surroundings. Enjoy fully-licensed dining in Dunedin's original courtyard cafe - one of the few city cafes to offer an outdoor dining experience. Adjacent to the University of Otago and Dunedin Public Hospital. Dunedin restaurant and training facility for catering, food and beverage students at Otago Polytechnic. Dunedin cafe style bar centrally located. Specialising on good food and service in ambient and relaxing surroundings . 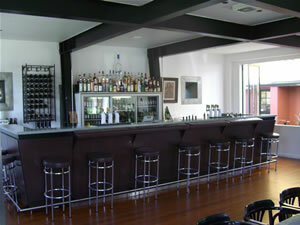 Tilikum Restaurant and Bar offers delicious Pacific-Rim cuisine with a unique Kiwi flavour in a relaxed atmosphere. Our excellent selection of New Zealand wines is enhanced by the best of the local vintages. Traditional Chinese Restaurant on George Street, in Dunedin, offering Yum Char lunch special and a la carte dining. Small country style hotel room, with separate bathroom and toilet. Italian cuisine, Pizzeria and Spaghetteria. Licensed and BYO. A must see visitor attraction in Queenstown gondola and restaurant offering spectacular views overlooking Queenstown, function and conference facilities the Luge, an exciting adventure ride. Nestled in the rolling hills of the Cardrona Valley, the Cardrona Hotel (established in 1863) is one of New Zealand’s oldest hotels. Innovative a-la-carte cuisine served daily. The "Middle Pub" is situated at the south end of Alexandra's shopping centre with accommodation views of the river. Full bar and bottle store, TAB, pokies, bistro and home cooked meals with a sunny beer garden. Sky TV is available. Historic, unique hotel with affordable room rates. The restaurant has sweeping views over Lake Hawea. Relax and enjoy a beverage with something to suit everyone from light meals to fine cuisine. Bar and restaurant situated in the historic Speights Brewery. We are a vegetarian/vegan café, open six days a week with Monday to Friday evening dining. Seafood and steak restaurant in George Street close to the University area.